1. Paul George: After struggling from the field in the Pacers losses, George has continued to look more and more like his All Star self. Culminating in the victory over the Heat in the first of 10 Hickory games, PG put up 36 points and 12 rebounds in a nationally-televised game almost as if PG had some extra motivation to show the world he was back. He’s quickly looked like himself on defense. Only complaint is that his careless, lazy passes are still showing up in full force. Funny, I didn’t know Hoosiers was rated PG-13. Paul George puts up 36 points & grabs 12 boards to lead the Hickory @Pacers! 2. Monta Ellis: Ellis has struggled so far to find his rhythm offensively in terms of scoring the ball. He’s shooting only 33% and averaging just a hair over 10 points per game (well below his typical 18-19 PPG). The encouraging thing is that even during this rough shooting stretch he’s found ways to set up a lot of corner threes to George Hill and Paul George. Ellis leads the Pacers in assists per game. While Ellis’ defense will never be his forte, I haven’t noticed him being an active liability in that regard, and he’s big part of the Pacers leading the league in steals per game. 3. George Hill: Blonde George Hill is strong from long range in the first six games, shooting 50% from deep. He’s missed a surprising amount of free throws early this season, which may be explained by his recent wrist injury (though that hasn’t slowed down his three-point shooting). Hill’s managed to stay an active part of the offense even with the addition of Ellis and has benefited as much as anyone offensively from the Pacers decision to play more spread lineups. 4. CJ Miles: Miles was on fire for the first couple games, but went cold in his last two games he played in before sitting out due to a sprained ankle. CJ’s the key to using the spread lineup and has been the one guarding 4s and being guarded by 4s instead of Paul George. 5. Ian Mahinmi: Mahinmi’s overall averages would look much better without the Pistons game that he left after 5 minutes with a back injury. Ian’s never looked better on the offensive end, taking and making midrange shots with confidence, executing one dribble drives to the rim, and even passing it out to open shooters occasionally. While opposing bigs have had their way on the offensive end, I don’t fault Mahinmi much. It’s often been by the lone big in spread lineups helping off of his man to stop a drive. This leaves the opposing big by himself for an easy rebound. 6. Rodney Stuckey: Stuckey has been solid in his role as lead scoring threat off the bench. Only complaint is when he has settled for too many midrange shots on occasion. Godney’s at his best when he’s aggressively driving to the rim and getting to the foul line. Hopefully, his sprained ankle won’t keep him out for long. 7. 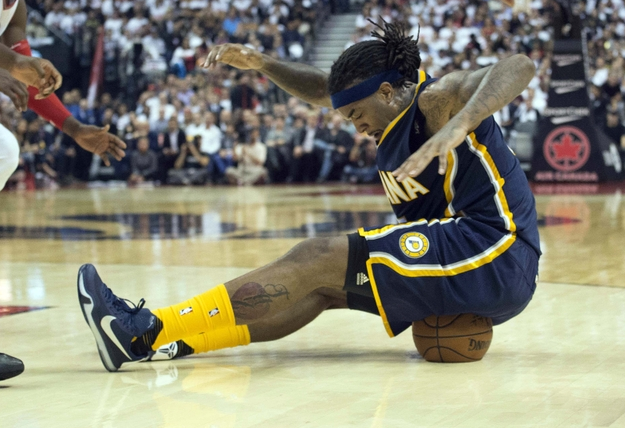 Jordan Hill: The picture above perfectly describes Hill’s first two games as a Pacer. He played so poorly on both ends that Vogel took him out of the rotation in the third game. Maybe this served as motivation for Hill as he’s had 2 double doubles and has been a key contributor in each of the team’s three wins. 8. Myles Turner: The Pacers first-round pick has given fans plenty to cheer about with his smooth shooting stroke and great rim protection. Turner still has plenty to learn on the defensive end as savvy post players have had their way down low with the 19 year old early, but as he gains experience and gains strength Turner still looks like he could be the steal of the draft. 9. Lavoy Allen: Allen’s been doing what he does best through the Pacers first six games: rebounding. His grade would be higher if not for a few terrible offensive plays. Allen has tried a little floater a handful of times close to the rim and hasn’t connected on any of them. Here’s hoping he drops that shot from his arsenal. 10: Chase Budinger: Budinger has the worst Net Rating of all the Pacers that have played meaningful minutes at -16.4. This is partly because he was on the floor during the woeful offensive stretch in the first quarter against Miami, but it also speaks to the team’s poor performance while Bud has been in the game so far this season. For Budinger to be an effective cog in the second unit, he’ll have to hit some threes and so far he’s only shooting 25% on attempts from distance and less than 30% overall from the floor. Unless he starts hitting shots, his spot in the rotation is likely to be lost to the next Pacer listed. 11. Glenn Robinson III: GR3 missed the team’s first four games while recovering from a shoulder injury and got healthy right when CJ Miles was forced to miss a couple games due to a sprained ankle. Robinson has taken advantage of his opportunities and looks like the best small forward option off the bench. Vogel seemed to recognize this as GR3 played crunch-time minutes against the Heat and secured an offensive rebound late to get fouled to help the Pacers hold on for the win against Miami. It shouldn’t be long before he takes all of Budinger’s minutes, especially if he keeps up his solid, confident play. 12. Joe Young: After it looked like Young was in line for backup point guard minutes in the preseason, Mighty Joe has yet to really play meaningful minutes for the Pacers in the regular season. Instead Vogel has used Ellis or Stuckey as the backup point whenever George Hill is on the bench. This may change for a few games with Rodney Stuckey out with an ankle injury, starting with this afternoon’s game in Cleveland. Look forward to seeing what he can do. 13. Solomon Hill: After starting 78 games last year for the Pacers, the former first-round pick has fallen all the way out of the rotation and his 4th-year contract option was declined by the team. I’m not complaining.